Liz's Paper Loft: MCT February Release Blog Hop ~ happy birthday! I might have gone too far, but I was having so much fun with the new stamp set! This kitty is soo much fun to color, with the options endless. For our "Freebie" stamp for this release, we are giving away this ADORABLE stamp "Wishing You" to the FIRST 150 shoppers! YEP, you heard that right, this stamp will go to the FIRST 150 shoppers for FREE! You do NOT have to add it in your cart, Emma & her shipping crew will automatically include it in your pkg, ONLY to the first 150 shoppers! IF you happen to come through AFTER the 150th shopper, no worries because this stamp will be available for sale! ALSO, DON'T FORGET our sale starts RIGHT NOW! Use the code: FEB2015 to receive a discount off your entire purchase! This sale applies to "IN-STOCK" items ONLY. This sale will end on Friday, March 1st @midnight PST. Absolutely adorable Liz! Oh my gosh, the papers, layering and all of Ms Emma's goodies...you showcased them just wonderful! I love that sweet little kitty! That kitty has beautiful markings. I love all of the layering. Thanks for a week of inspiring projects. So cute - love all the layers and the cat. You coloring on that kitten is amazing Liz! Love your card. Fabulous showcase of the new release! You and MCT = recipe for awesome! Your card is purrfect! Love all the layers! Very fun card! OMG Your card is so adorable...OMG so many neat clever and creative ideas to say the least. Love your stitching too. Love the colors and all of your layers OMG You sure do rock Miss Emma's goodies. Thanks for all your inspiration I so can't wait for my order to arrive. YOU so ROCK!! OMG LADY!!!! Your coloring of your kitty is just STUNNING my friend!!! WOWEE!!! THANK YOU for your AMAZING projects this entire week! GREAT job!! Sweet card! 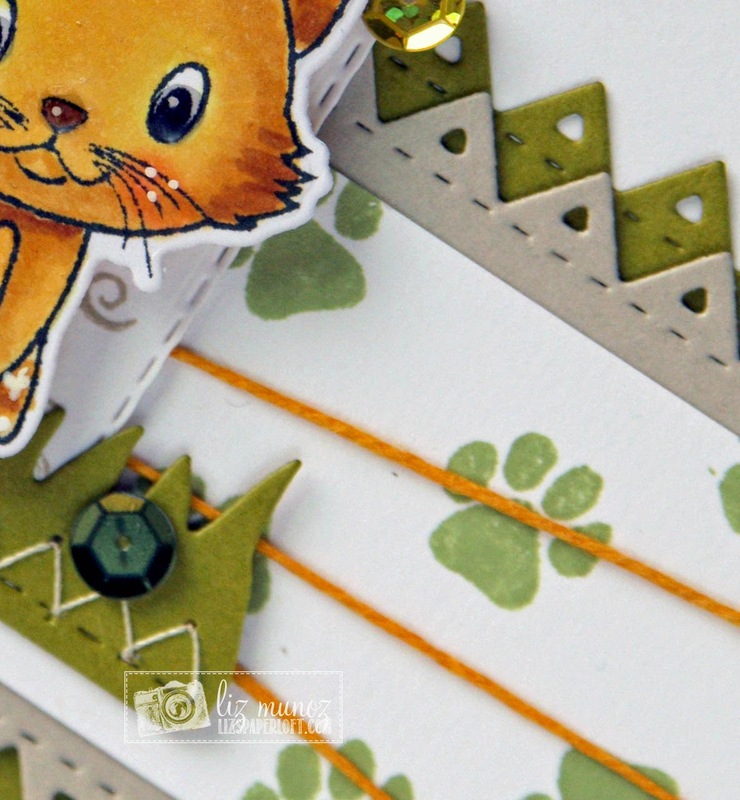 Love the layering and dies you used, along with that adorable kitty! Awesome coloring! I love the kitty stamp. The kitty in your card is the same color as my two..
Liz this is adorable, that kitty is the cutest, I so what to color like you, awesome project!! So adorable!!! That kitty reminds me of my old cat Sammy, so cute! It's all about the layers, bout the layers...no color :D You are so fun! Now I have a song in my head. I love the layers and don't think you went too far. Love the way you colored your kitten! Fabulous job! I am so in love with this set and your not helping! That is adorable! Your card is beautiful!!! I love all of the layering and the colors you paired together! Loving all the layers!! Super cute card! Adorable! I've really enjoyed seeing how everyone colored their kitty this week. So many possibilities. Fabulous layers! I dig it. overly card. I like the many layers. What a cute card Love it! Liz ~ OMG ~ I am in awe here! This is seriously GORGEOUS but yet so darn ADORABLE! LOVE everything about it! FABULOUS job all week! LOVE LOVE LOVE the coloring on your kitty!!! This is such a cute cute card!!! Sweet card, love the coloring of the kitty and all the layering. Adorable. I like all the layers and the fun edges. Fun card! The little paw prints are "purr"fect! Fun, fun, card! That kitty stamp and die set is adorable. A-Mazing creations! Love the colorful background on the last card but the kitty card has stolen my heart! Great layout on the adorable kitty card. 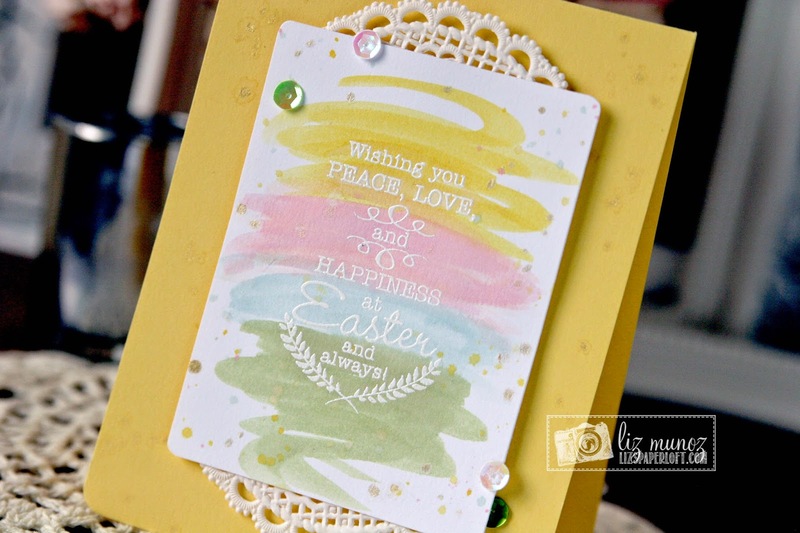 I absolutely love how you made the Easter card with the pastel brush strokes and the embossed sentiment. Orange is not my favorite colour, but your card combines lovely with the kitty cat and threads and the other colours tooo ofcourse. This card is purr-fect! Love the layers! OMG!! Your card is adorable!! Such an awsome card, Liz! I love all of the layers... especially how you did them with tags! So darn cute! WOW,this card is stunning,Liz!!! I love the colors,how you colored the cute kitty and the details!!! Awe what a sweet card. Adorable !! I am LOVING the kitty set--y'all are So creative! Your kitty card is so sweet! Love the sequin accents! Cute kitties .... LOVE the little milk cartons - great inspiration. Love that kitty and your layout. Beautiful! Great inspiration, particularly the Easter one. This is my fav...the kitty. Love the stitching and love those wisker cheeks! 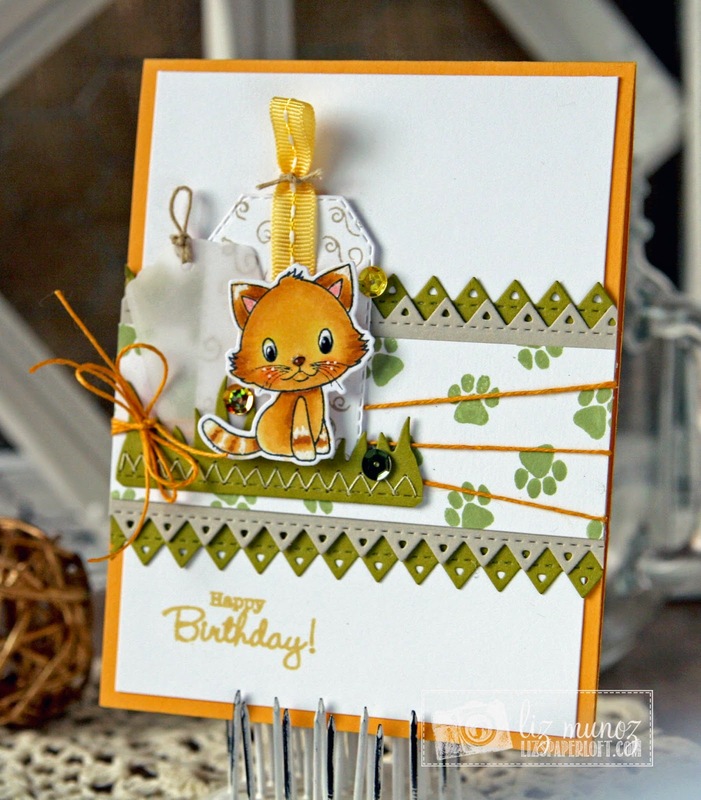 Love the layers and the kitty is so bright and cheery - just adorable! So cute cards with so fun details on it, love it. OMG! That kitten is so adorable! Love it! I just love what you did with the new You had me at Meow stamp set. Great release, I'm looking forward to my shipment. OMG, how adorable is that kitty? Your card is just too cute! 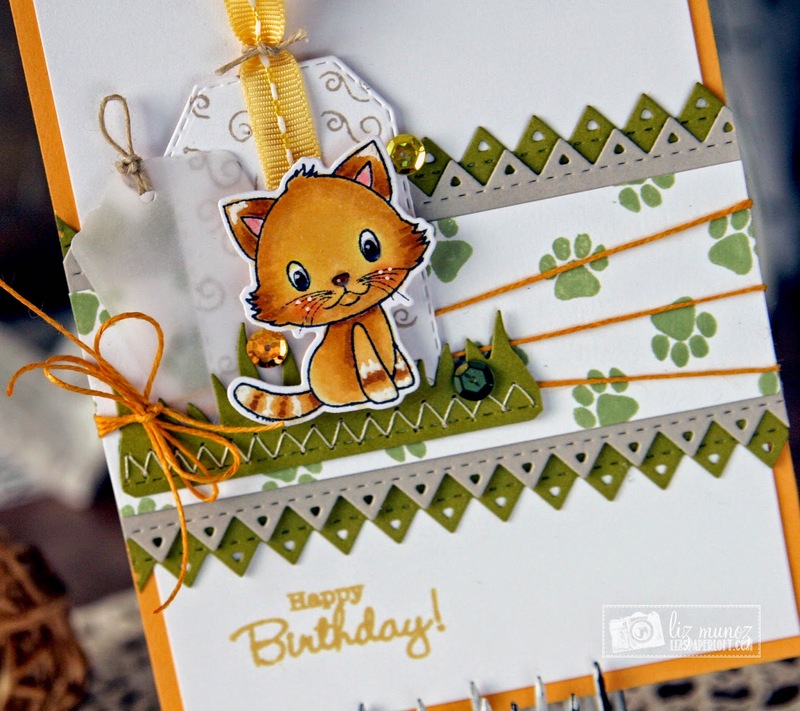 What a FABULOUS design on your cute kitty card!! Thanks for sharing!! Adorable! Your little kitty is soooo cute! What a super ADORABLE card Liz!!! Your kitty is colored so beautifully!!!! LOVE your card Liz!! All the details are just purr-fect, and the coloring on the kitty is phenomenal! !